RICHMOND – Governor Terry McAuliffe announced today, Oct. 27, the launch of Virginia’s “NSA Day of Cyber” School Challenge. The challenge begins today and will run through the end of March 2017. Participating students will take part in rigorous, real-life virtual cyber scenarios, discover the skills and tools used by NSA cyber professionals, and explore the vast number of careers in cybersecurity. Students will each receive an individualized Cyber Resume and NSA Certificate of Completion. Schools will compete for the highest student participation over the course of the next five months. Schools with the highest student participation will win a cash prize that will go toward enhancing cyber programs within their schools. These participants will also be honored at an awards ceremony in Richmond. Governor McAuliffe is encouraging high school educators across the Commonwealth to take part in the “NSA Day of Cyber” Challenge by registering and participating before the end of March. Virginia educators can click here to sign up, or learn more at http://nsadayofcyber.com. For additional information, please contact Kimberly Paradise at kim@lifejourney.us. 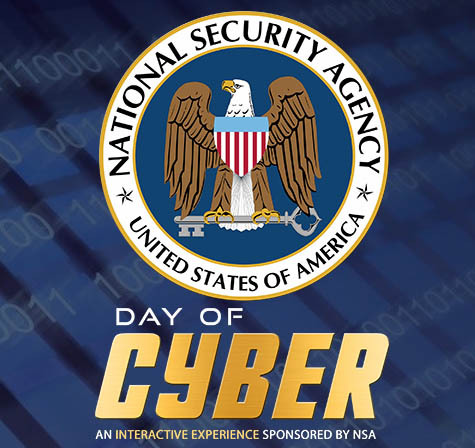 The NSA Day of Cyber, sponsored by the National Security Agency and powered by LifeJourney technology, is an online, self-guided career exploration and mentorship platform that enables students to test-drive cyber careers and live a day in the life of six leading NSA cyber professionals. Each student will receive a Cyber Resume and Certificate of Completion signed by the NSA. Tags: career, certificate, computer, cybersecurity, Day of Cyber, education, National Security Agency, Network, NSA, Virginia. Bookmark the permalink.